Poet and eco-elder Gary Snyder grew up on a farm in Washington state. When he was a boy he asked his Sunday school teacher if he would meet a beloved and recently dead heifer in heaven. The clergyman said no. "Then I don't want to go there!" said novelist Jim Harrison from across the dinner table, listening to Snyder tell this story. "That's exactly what I said!" Snyder exclaimed, explaining that this exchange inspired his interest in other cultures that included the non-human in their moral universe. It's a moment in a documentary film directed by John Healey that is conveniently tucked (in DVD form) in a plastic envelope at the back of this book. So, add the book-with-the-movie to the music CD/concert DVD packages and all the other hybrids. 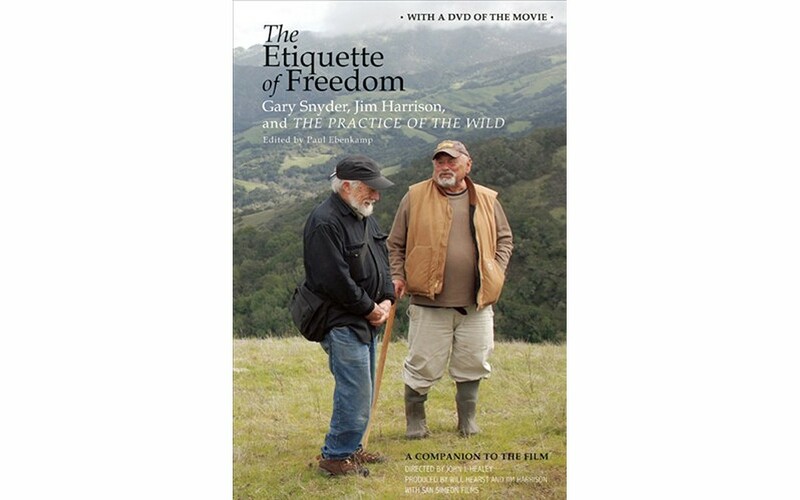 The book is marketed as conversations between "old friends" Snyder and Harrison, but in fact it is culled from the making of a film that is essentially about Gary Snyder, in which Harrison (a co-producer) participates. Also interviewed are poet Michael McClure (recalling Snyder from both the Beat and Summer of Love eras in San Francisco), academic Scott Slovic and others. The film was keyed to the 20th anniversary of Snyder's landmark book of essays, The Practice of the Wild. (I got that book when I spotted a used copy shortly after it was placed in the window of the old Arcata Bookstore. "I knew it wouldn't stay there long," the owner said.) This book includes a transcript of the movie, but also a lot more, including Snyder-Harrison conversations in which Harrison comes off a lot better than he does in the film. It finishes with some Snyder poems and a chapter from The Practice of the Wild. The DVD also has extras, including more from the interviews, and more of Snyder reading his poems. All this is good, because the movie itself is on the thin side. Still, the DVD provides the sense and sound of these people, and you get a little companionship along with the substance that is primarily available in the handy form of readable words in the book. And there are those filmed moments, like the one that begins this review, that really help illuminate Gary Snyder and his work. So in the end this is a garden of delights: interesting conversation, recollections, images and Gary Snyder reading his poems, which may not be essential to appreciating them, but adds a special dimension. I once had the privilege of hearing him read for several hours at a time, several days in a row, a revelatory experience. Now I can pop this into the DVD player any time I want! Thanks to this book.